File photo of Blacka holding a mountain chicken survivor found on the Fairy Walk. Once a popular delicacy, the mountain chicken suffered critical losses as a result of the Chytrid fungus. Scientists hope that this fourth release of mountain chickens will help them beat this fungus by changing the frog’s environment. The Durrell Wildlife Conservation Trust and the Department of Environment are again partnering on the project. Luke Jones, a research assistant with Durrell is on island looking for mountain chicken survivors. Starting in 2009, mountain chickens were sent to various zoos and conservation centres across the United Kingdom to propagate more of them as numbers were critically low. Under the Mountain Chicken Project, the frogs were re-released on the island at three different times. All but two of the frogs which were tagged and released have survived, Jones explained. In 2016, only two of the frogs were found. The researcher, along with colleagues from the Department of Environment, have been periodically searching for any other survivors. They are also trying to discover any remaining mountain chickens in the wild. 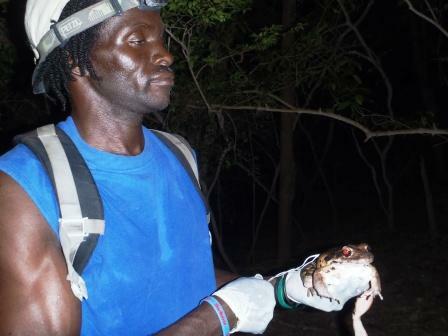 “Because we can’t feasibly remove the Chytrid disease, which is microscopic and widespread throughout Montserrat, the plan is to alter areas of the ecosystem so that they are suitable for the endemic wildlife (such as the mountain chicken), but unsuitable for the Chytrid fungus,” explained Jones. “We aim to do this by creating a safe haven from the Chytrid fungus. These safe havens will be areas in the local environment which regularly exceed 28°C (82.4°F), at which point the Chytrid fungus is unable to survive. The idea is that this will enable the mountain chickens to be regularly exposed to the Chytrid fungus, but as they move through these ‘safe havens’ the higher temperatures will kill the Chytrid fungus. Lloydie and Teese check out a mountain chicken. The team is currently establishing the first safe haven over in the dry forest on the East coast. “This area is ideal as it’s usually hotter and therefore easier for us to manipulate to the temperatures required. We are also looking at leading upcoming community engagement and outreach sessions to the local community and to local schools in order to educate and engage them in the project,” the researcher added. The success of the experiment could mean not only the survival of the mountain chicken here but also on Dominica, which is the only other place the amphibian exists. There are said to be approximately 130 mountain chickens there. Jones said “the impacts of recent hurricanes in Dominica have been devastating and put a lot more pressure on their mountain chicken population there. If we are successful here in Montserrat we will likely take the lessons learned here and apply them to the project in Dominica also. 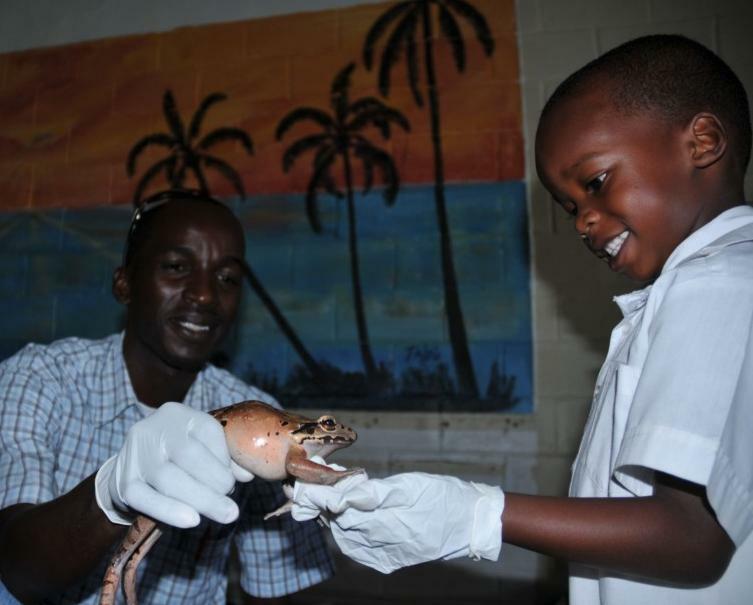 Montserrat is very much leading the world in the treatment of this Chytrid disease. If successful the impacts will go well beyond the Caribbean and the techniques developed in Montserrat will be used to manage wildlife at risk of extinction due to the Chytrid disease all over the globe. The team working on the ground in Montserrat is currently comprised of Jones, working with Durrell Wildlife Conservation Trust, the Director of Environment Miss Corbett, Lloyd Martin, and an experienced team of local wildlife experts including Blacka, Scriber, Tavis and other members of the Department of Environment. Also on call. are a team of international experts partnered as part of the greater Mountain Chicken Recovery Programme, which includes Durrell Wildlife Conservation Trust, The Zoological Society of London, Chester Zoo, Nordens Ark in Sweden and Paignton Zoo. The community will be invited to learn more about the project as it evolves. A fundraising campaign will soon be opened to help fund the research. The link (https://experiment.com/projects/creating-a-refuge-from-amphibian-chytrid-fungus-for-the-critically-endangered-mountain-chicken) to the grant page includes all of the information about the project, it will have regular updates and will allow the public to contribute to the project.